In India, menstrual health is often a neglected or difficult topic. 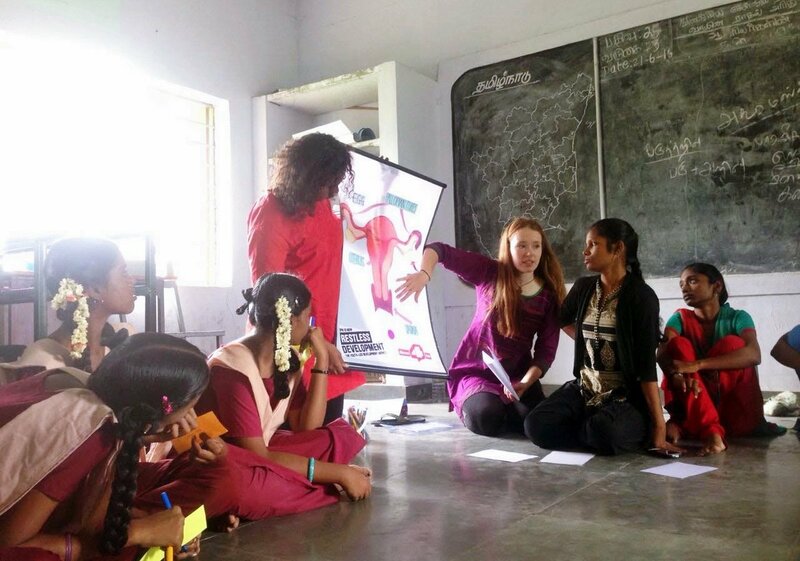 Georgie James is currently volunteering with Restless Development in India with International Citizen Service, and through her team’s shared blog, The Wandering Volunteer, she talks about their work on menstrual health management. I have now been living in Vanjur Village, Vellore for almost 2 months and it is safe to say we have been welcomed into the community wholeheartedly. It is almost impossible to walk down the street without being greeted with waves and smiles. Family life in India is of the utmost importance, often a whole extended family live in one home and all members of the family have a distinct role in contributing to the running of the household. Womanhood and fertility are greatly valued; pregnant women are treated with respect, something I have experienced firsthand as our host mother is currently expecting her first child. However, this high regard for women and girls is underpinned with a lack of understanding about their own bodies. In India almost 70% of girls know “nothing” about menstruation before they start (WaterAid) and 10% believe that menstruation is a disease. Furthermore, the BBC estimates that 70% of all reproductive diseases in India are caused by poor menstrual hygiene. It is for this reason that Restless Development have chosen Menstrual Health Management (MHM) as one of their key issues to focus on. Since arriving in India I have learnt a lot about the reality of being a young woman here. Menstruation is not a subject widely spoken about and is somewhat of a taboo. It has been a challenge to get our national volunteers to open up and talk to us about the issue. It is a subject delegated to whispers, and conversations with men and boys in the room is out of the question. However, as we have got to know each other and gained each other’s trust open conversations have become much easier. I have learnt a lot but can only image the panic and confusion faced by many girls when they start their period. They are often separated from their families, prevented from going to school and barred from the kitchen with no explanation as to why. This is then contradicted when the family throw the girl a “coming of age” party where she is dressed up in ornate clothes and jewellery and family and friends bring her gifts and pose for photos. However, it seems some girls are proud of this event. The daughter at another host home was very keen to show us the album of her party that signified she was ready for marriage and to have children. While this celebration of womanhood may be something to be admired, often little/no information is provided to girls about what will now be a monthly occurrence in their life. UNICEF estimates that 85% of girls in India use cloths during menstruation but I have learnt from our national volunteers that these are seen as dirty and something to be hidden. Therefore 41% of adolescents conceal their cloths in their rooms meaning they cannot be properly washed and dried, leaving girls vulnerable to infection. On my placement we are hoping to celebrate tradition while educating girls about what is happening inside their body and equip them with the knowledge to manage their menstrual health. When planning sessions for girls at our local secondary school our first challenge was to ensure volunteers, national and international alike had a clear understanding of the female reproductive system and the menstrual cycle. While there were some difficulties due to the Tamil/English language barrier it was a special experience to develop and equal understanding amongst the team. Monday 27th June marked our first MHM session to girls at Thirumani High School. We delivered two sessions to two different age groups: 12-13 year olds and 14-15 year olds. Despite our initial apprehension that the girls would be unwilling to engage due to embarrassment, we found the informal way we had planned the session made the girls eager to open up, participate and ask questions. I felt emotional to see our national volunteers, who had grown up knowing menstruation as a taboo, become so confident in passing on their knowledge to others in their community. It gave me hope that education about MHM could slowly help women and girls become more confident in celebrating their womanhood. Read more from Georgie and her team here: The Wandering Volunteer. Using street drama as resistance: Child Marriage.